Happy Wednesday! Today I’m sharing what’s on my 26th birthday wish list! My birthday is in 9 days and my parents come to town tomorrow so I’m starting my birthday festivities already. Every year (except one year) I make a wish list of all the things that I have my eye on and want for my birthday. Sometimes I get a few things on it or sometimes I have noticed I buy the things from my wish list a few years ago so it’s just a mini guide on what I wanted at the time and if I save up the money then I end up buying it. I was going through all my birthday wish lists which I have linked all of them by year down below and some of the items I now own which is really cool. This is my way of putting it out there to the universe and it comes back to me. 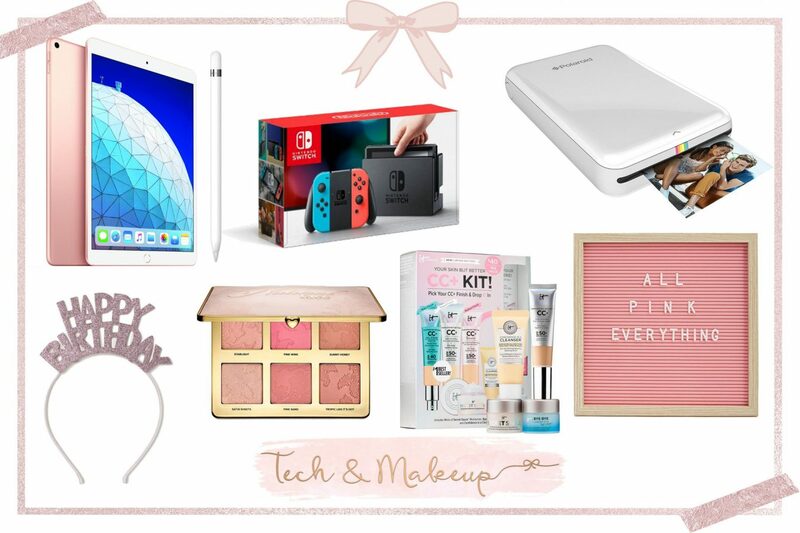 So here is the 2019 version of what’s on my 26th birthday wish list! Now to start with my what’s on my 26th birthday wish list, I thought I would explain how hard it was to think of things again this year. Not as hard as last year though. I have a lot of tech items again this year. I have a list on my phone and when I’m out I listed the things I saw. It’s quite a mixture this year and even if I don’t get everything again this is just a guide I set up. I saw this portable printer a few months ago and I thought it was such a cool gift idea. I want to make a scrapbook of my New York trip and having this to print off the pictures I took on my phone would be so cool. If you didn’t know this, I am a massive fan of Nintendo game systems and had almost all of them growing up. Since I have an iPhone I didn’t think I needed one but on the other hand I still want one. I couldn’t really think of anything new to add that I haven’t before so I thought a Nintendo Switch would be a great birthday gift. Now this is very recent want for me. I realized that my iPad Air is turning 5 this year and I use it so much. Since it is getting old it is starting to lag a little. I saw they came out with a new one again and it has the compatibility to use the Apple Pencil so I thought that would be such a good upgrade for me and I can get creative with it. So I think it’s time for me to get an iPad Air this year. Since I have my own apartment and have been collecting random things like this Pink Sign Board I knew it would be perfect decor for above my fireplace and I could customize the messages on it. Plus it’s pink so it will match my color scheme of my apartment. I noticed that I don’t own many blushes in my collection or any palettes with multiple blushes so I thought I would add it to my wish list. This Too Faced Cheek Palette caught my eye and it’s just so pretty and looks like shades I would wear or try to wear. I also see that Too Faced is a brand on my birthday wish list for a few years now. I recently blogged about my love for the It Cosmetics CC Cream I wrote here and I saw they had this promotion on Sephora. I can’t wait to pick up my birthday freebie from them so I should get the full size of my favorite foundation and this kit looks so good and great for my money. I know this is silly but I am totally buying this. It’s so cute and actually matches my birthday dress. I might even wear this Happy Birthday Headband to dinner when I go out with my parents. This dress has been on my wish list for a while so I thought I would add it to my birthday wish list as well. It’s so pretty and it was a contender for my birthday dress but I went for something a bit more extra. It’s still pretty though and I can see me wearing this Tiered Floral Dress all spring long. Another item that has been on my wish list since last year even. I eyed this pretty Monogram Tote Bag from my fave bloggers and fell in love straight away. I’ve been wanting the designer version but it is just too much for me so this is a great dupe and I can get my monogram which I don’t own anything monogrammed so this is such a cute birthday gift. I think by now you know I am a big fan of bags and I am more of a bag girl more than shoes. I mean I love shoes too but bags are my weakness. I saw this and I love that it’s another dupe of the bag I want. It’s a pink quilted crossbody bag and I don’t own too many pink bags. It also matches my birthday dress perfectly so by this bag I think you can see what theme I went for. I’m in need of a new wallet. I actually had one quite similar to this but I wore it out and used it to death so I had to buy another wallet but that one is getting old and tattered too so what’s better then getting a new wallet (and some money) for my birthday with this pink bow wallet that is so my aesthetic. One more bag which I featured one similar in my spring wish list here. I can see this being my spring and even summer bag so I’d love to pick a straw circle bag up and style it with all the outfits I have in mind for the season. Even though I am a bag person, I couldn’t resit adding these Adidas sneakers to my wish list. My roommate and I were shopping for a pair for her and she convinced me I needed a pair and she was right. I own one pair of sneakers and been wearing them quite a lot since I moved to LA so getting these would be great and very comfy footwear. This is another one to go with my birthday dress. My dress needs statement earrings so these will be perfect for the evening. 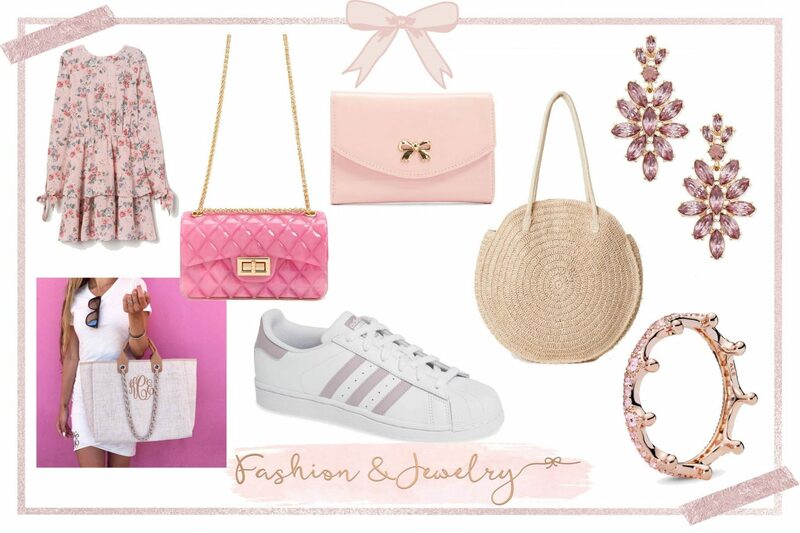 I love the design of these pink statement earrings and also they would look great with other outfits when I want an accessory to stand out with my outfit. Last but not least is another kind of tradition I’ve added to my wish list. So I added charms, bracelets and rings to my birthday wish lists and looking at the old ones I noticed I bought all my dream rings so this is the next one I want to add to my collection. It is so pretty and matches my other rings and my aesthetic. So I hope I get to buy this pink crown ring one day. That is what’s on my 26th birthday wish list! Another year in the books. I love this tradition and looking bacl to see how I have changed from a teen to a young adult as I write this blog. Again, I listed the previous wish lists down below if you want a little throwback as well. I had fun creating this and I actually can’t wait for my birthday this year. So I hope you enjoyed what’s on my 26th birthday wish list this year and to more birthday wish lists to come! Wow you have such a great selection of cute items on your wish list.Thanks for sharing. So many fun items! I would love that portable printer, too! We have a Nintendo Switch and it is pretty awesome! I love pink too! I love that pink sign board. What a great spread of fun things! Happy soon birthday! All of these things are awesome, I especially like that polaroid printer, that seems so handy!